A few weeks ago, I got a Chinese algae-eater for my aquarium, although the pet shop called it a golden sucking catfish. 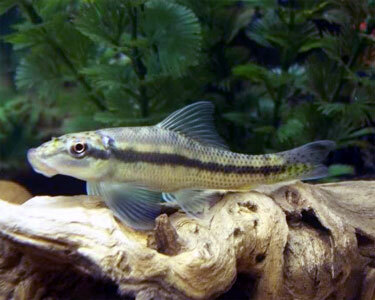 These plain looking fish grow up to 28 cm long. Chinese algae-eaters have a mouth that is well suited for sucking surfaces so that they aren’t swept away by the strong currents where they live. The have special gills that enable them to breathe without taking in water through the mouth while they are sucking. Females are rounder than males and males have longer tubercles growing around their mouths. As their name suggests, they mainly eat algae, but they also eat other slime and food that they can find on the bottom of their streams. As they get larger, they also eat other fish. Chinese algae-eaters are found throughout southeast Asia in large fast-flowing rivers and flooded areas. Are there any other interesting facts that you would like to share about Chinese algae-eaters?